For dozens of elected representatives and losing candidates, as well as the Union Election Commission, the election process is far from over. NAYPYITAW (Myanmar Now) – On a recent February morning, just after Myanmar’s new, democratically-elected parliament convened amid near-universal praise, the office of the Union Election Commission (UEC), situated in a remote corner of the vast capital, was abuzz with activity. For ordinary citizens, who overwhelmingly voted for Aung San Suu Kyi’s National League for Democracy (NLD) on Nov. 8, the electoral process is over and attention has shifted to the question of whether Suu Kyi can overcome constitutional constraints to become the next president. For dozens of elected representatives and losing candidates, as well as the UEC, however, the election process is far from over. Take Khine Nyi Nyi Kyaw and Aung Kyaw Nyunt, from Shan State’s Yat Sauk Township. This was their third trip in three months to Naypyitaw, Myanmar’s grandiose capital with its manicured lawns and wide, empty boulevards. They are involved in a malpractice complaint brought by NLD candidate Khine Nyi Nyi Kyaw against the USDP’s Aung Kyaw Nyunt, after he lost a seat in the Shan State parliament by a margin of 1,010 votes. Khine Nyi Nyi Kyaw says ineligible voters were included to give his rival, an incumbent minister in the state government, the winning ballots. Aung Kyaw Myint’s lawyer argued her client is not responsible for what the local election commission has decided. Theirs is one of dozens of cases the election tribunals have been hearing since late December. According to the UEC, there are currently over 200 cases; 175 cases involve representatives or election agents who missed the deadline to submit campaign finance reports and 45 cases involve complaints against the election winners. The majority of complaints are against NLD winners by candidates from the outgoing, army-backed USDP. As proceedings continued, Khine Nyi Nyi Kyaw and Aung Kyaw Nyunt said they had little idea of when the case would end and the expenses are starting to bite. Khine Nyi Nyi Kyaw said he has to pay from his own pocket and not from his party’s coffers. “Our party helps me with ideas and legal advice. But I have to cover the fees for the lawyer and travel expenditure with my own money. The total cost for my companion and me is at least 100,000 kyats (about US$80) for each court hearing. But this third time will cost about 250,000 kyats as I had to bring more people,” he said. While the dispute cases will not alter the political landscape dramatically – the NLD has a comfortable majority in both national and regional/state parliaments – transparent and fair tribunals to resolve them are seen as another important step in Myanmar’s transition. The cases can improve the reputation of the UEC, which was viewed with distrust by the public in the run-up to the elections. On Feb. 2, the day Myanmar Now visited the UEC, nine complaints and three campaign finance reporting cases were being heard. Myanmar Now also witnessed the court hearing at UEC tribunal (2) involving NLD’s Lower House MP Nay Myo Tun from Htantabin Township. He faces a complaint by his USDP rival Thein Yi, who alleged that Nay Myo Tun’s representatives asked the voters within the perimeter of the polling stations on election day to vote for the NLD candidate. It was the second hearing in the case and Nay Myo Tun said he was worried it could become a lengthy and expensive process. Thein Yi refused to provide comment on his case when approached by Myanmar Now. Nyunt Tin, director of the Union Election Commission, said there is no fixed time period for a tribunal to conclude election disputes, adding that tribunals have to accept additional witness called by both sides. “The case for electoral complaints is the same as with civil suits. So, we cannot fix the number of hearings. The UEC chairman also understands the cost burden of MPs who are coming to Naypyitaw. So he is making some plans to set up tribunals at the respective constituencies,” Nyunt Tin said. The tribunals are located in two spacious rooms on the ground floor of the UEC building. They operate in a similar way to a normal court and are open to anyone interested in attending. Two notice boards outside the tribunals announce the cases that will be heard on the day, while details of all 45 complaints are pinned on three boards. Under election rules, candidates have 45 days following the announcement of results to submit their complaints to the UEC, along with a 500,000 kyats ($390) submission fee. Complaints are referred to ad hoc tribunals set up under the UEC. Appeals can be made, but the UEC has the final ruling. Human Rights Watch has criticised this, saying it violates international norms as there is no independent judiciary to give the final verdict. The UEC chairperson is appointed by the president and therefore not considered sufficiently independent. Frederick Rawski, field director in the Yangon office of the US-based Carter Center, which has been observing the elections as well as the tribunals, shares a similar concern. “Although The Carter Center has not seen any evidence of bias by judges during its observation, the fact that all of the tribunals are composed of UEC commissioners (as opposed to independent legal experts or judges), and that there is no right to appeal beyond the UEC, raises concerns – particularly in cases involving alleged misbehaviour by election officials,” he told Myanmar Now in an email. The Carter Center also has concerns about the framework governing the tribunal process, he added. “For instance, the exorbitant 500,000 kyat filing fee is much higher than the international norm, and appears to have been a factor in some candidates’ decisions not to pursue legitimate complaints. The frequent adjournments and the location of the tribunals in Naypyitaw also create substantial hardship for those wishing to pursue complaints from distant constituencies,” Rawski said. The UEC has indicated that it could relocate some hearings to the states and regions, but this has not yet happened, Rawski said. The cases focusing on campaign financing are much more straightforward and several judgments have been passed, the UEC said. The commission will blacklist the candidates who did not present their campaign costs. Fears that the losing USDP would file complaints en masse against winning NLD candidates to try and dent the NLD juggernaut have not materialised. 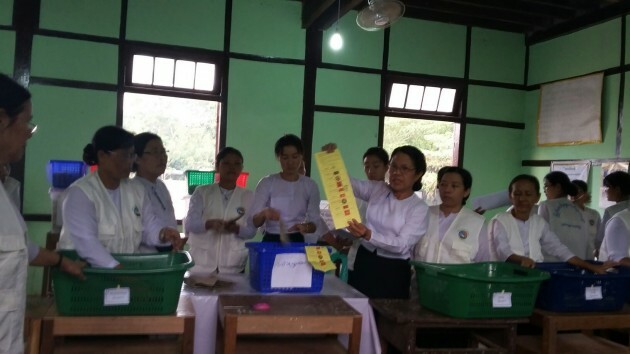 Still, a large number of cases involve NLD candidates, with the losing USDP party accusing the winners of malpractice ranging from defaming the government and the losing candidate, to misinformation. There are also cases the NLD has brought against others, the most notable one involving Zakhung Ting Ying, an independent candidate and leader of the New Democratic Army – Kachin (NDAK), an army-backed militia controlling large parts of eastern Kachin State. He was accused of barring NLD candidates from his area and of attacking them in Chipwe Township during their campaign. David Mathieson, a Myanmar expert at Human Rights Watch, said the case against the militia leader was an important test of the UEC’s independence. “I think its crucially important to have a fair and transparent trial in this case, not just to demonstrate that investigations into charges of electoral misconduct are important measures of democratic systems, but to also send a clear message that intimidation by politicians with links to militias has no place in democratic systems,” he said. *This article first appeared on Myanmar Now on 29 February 2016.